Dogs across the U.S., Great Britain, Canada and Australia are lining up to join canine swim clubs! Water therapy for dogs is a recent bloom among the canine natural therapies, which include chiropractics, massage therapy, and acupuncture. My sweetie was lucky to get a monthly pass to a canine swim club near us. He can't believe how great it feels to paddle his back legs without pain. The swimming helps him to get strength back in his legs so he can walk better; Cushing's Disease had weakened his lower spine to where he was unable to get up from a lying or sitting position by himself. He swims in a large jacuzzi with the jets off and I am working with him offering shouts of 'good boy!' and giving him some extra resistance when he can handle it. Most dogs work with the canine water therapist. Some swim in a life jacket; others don't need one. (I had to rescue mine from a deep water pool recently, so I know he needs a life jacket -- the Doggles help to keep water out of his eyes.) I've been surprised by how many large dogs I've seen who are afraid of the water, but grow to enjoy it with exposure. 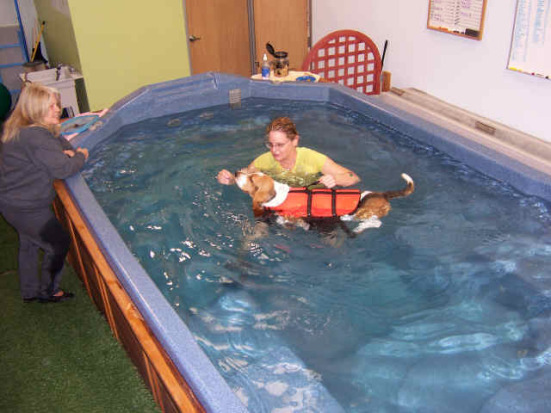 It's not just dogs with musculature problems that benefit from swim therapy. Water therapy is often recommended by veterinarians post surgery to get dogs back to their normal lifestyle as soon as possible. 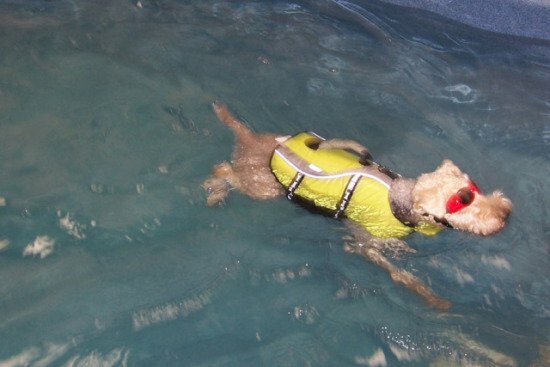 Canine water therapists work with athletic dogs and working dogs. And amazing results can be attained with aggressive dogs, dogs who need to learn to bond with other animals or people in the family, and dogs with territorial issues. Many canine water therapists give their time and resources to shelter dogs to help them become better pets in adopting families. Certainly, those who have adopted dogs with unwanted behavior problems are encouraged to bring dogs to water therapy. Canine water therapy, unlike canine water sports, is conducted in warm water -- 83° and above -- and generally indoors. 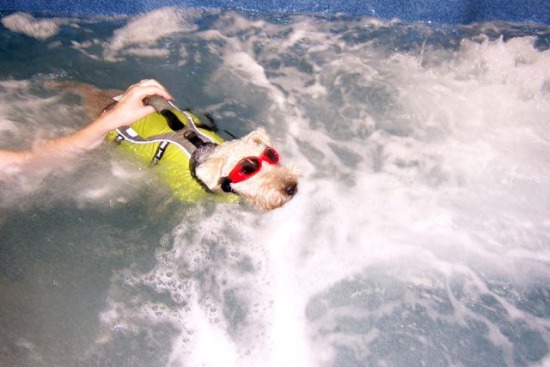 The 'pool' may be a large spa, like the one we go to, with massage jets that both you and your dog can enjoy. Even if your pup has no issues whatsoever, swimming gives you a new way to bond with your pets -- teach him a new skill, play new games with water toys, and maybe meeting some new dog friends. And don't forget the massaging spa jets both of you can enjoy to chill you out! For a Canine Water Therapist near you, check out the Association of Canine Water Therapy directories. 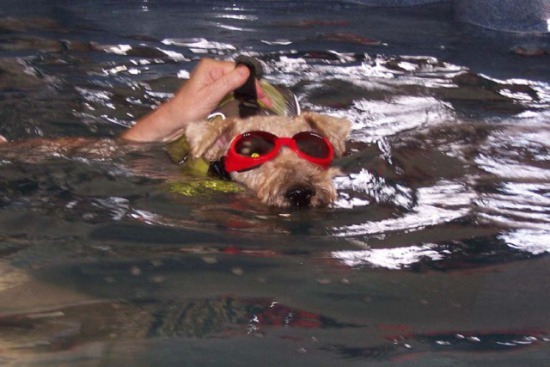 Thanks to the group of canine water therapists at The Total Dog Swim & Gym for use of your photos and wonderfully supportive care.